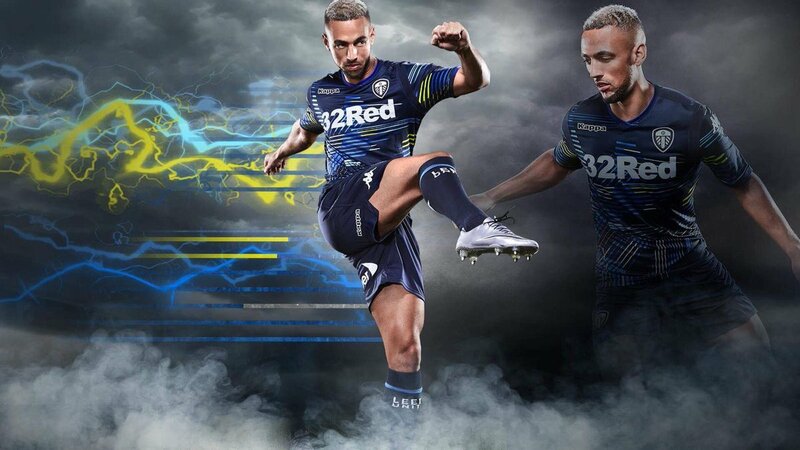 Leeds United earlier revealed their new 2018-2019 away kit to much reaction on social media. Made by Italian brand Kappa, it couldn’t be more different from the rather classy home shirt, being garish and colorful. The new away shirt is navy blue in colour featuring a white club crest and a bold white 32Red logo. Across the front of the shirt and the sleeves there are bright flashes of electric yellow, white and sky blue. The proud club motto ‘Marching on Together’ features on the reverse collar of the shirt with ‘Leeds United’ woven into the navy blue socks in white. Official kit supplier Kappa features in the top left of the shirt with their distinctive Kappa omni-logo also featuring on the sleeve and the shorts. Official secondary shirt sponsor Clipper is also featured on the reverse of the shirt, all in white. The new away strip is a Kombat kit which is a regular fit, with hydro-way protection and an interlock fabric. They all feature a v-neck with inserts on the shoulders, on the sides and on the back. A Bodyfit Pro version featuring a high performance fabric, as used by the first-team players, is also available for purchase.